Repair your Apple iMac G5 for a fraction of the cost of a new motherboard or power supply. Learn more. Save now. This repair solution will save you a bushel of apples and keep more dollars in your pocket. You can make purchases from my eCommerce store at www.jwestsales.com for the Apple inside you. You can buy the parts to fix your Apple yourself. Don’t spend hundreds of dollars on Apple parts, but fix it yourself, and save a bushel of apples in your pocket now. 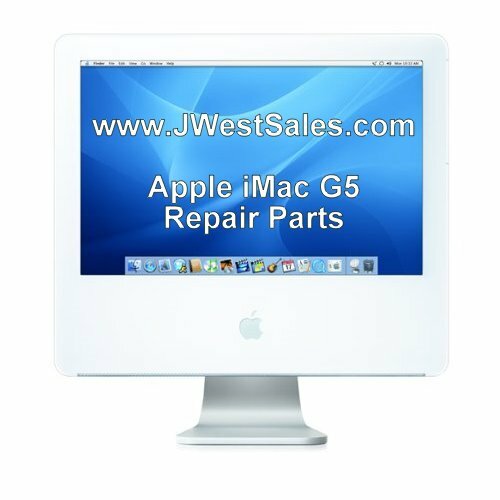 For your Apple G5 logic card, power supply repairs, and capacitors for sale, visit J West Sales for more details today. If you have any questions, feel free to contact me today. "I found your site through a Google search for iMac G5 repair. I inherited a broken iMac from my mother, which would not boot and made some awful noises. I was not surprised to find burst capacitors inside. You see, I am a former Mac Genius, and handled many many iMac logic board swaps due to the faulty capacitors. Now that the computer is older, the repair extension was expired. I still wanted to get it working, so I was delighted to find not only your helpful instructions, but that you sold exactly the right parts. While I was a Mac Genius, and have done hundreds of repairs on Macs, I have never held a soldering gun nor done any electronic component-level repair. I trained myself quickly using a Teach Yourself to Solder kit on Amazon, and followed your instructions. I am delighted to say that my iMac is in full working order, and is now about as useful as a PPC Mac can be. Thank you so much for your help! Sincerely, N. L."